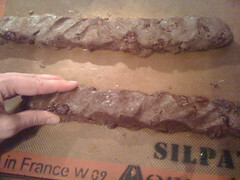 Lesson learned: staying up til 11:30 baking chocolate cherry biscotti is a much better idea than staying up til just 10:30, catching up on three episodes of 24. I hope to never again underestimate the restorative power of baking treats, especially if the process involved kneading dough. With chocolate in it. Unfortunately, I may continue to underestimate the stimulating power of thrilling action/espionage movies and shows. Love ’em! ‹ PreviousAre you being serviced? Next ›do I have to pull over?